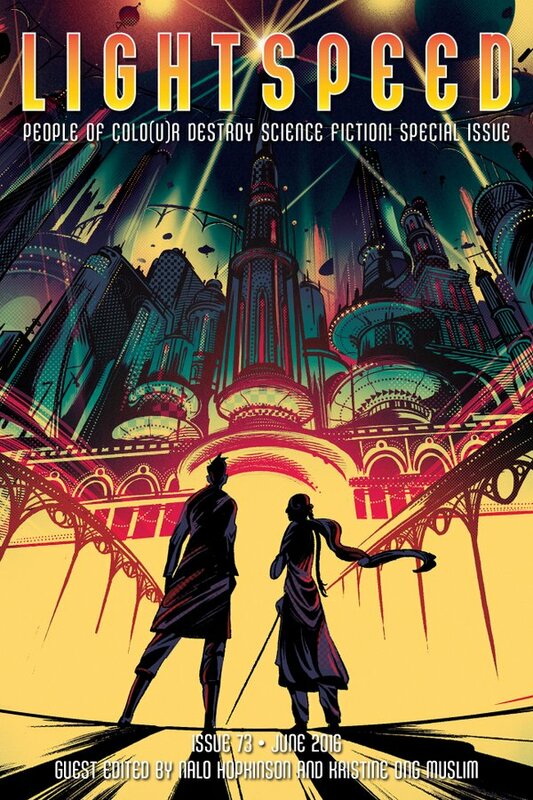 This month, we’ve made another special double issue for you: People of Colo(u)r Destroy Science Fiction! We’ve brought together a team of terrific creators and editors of color, led by Guest Editors Nalo Hopkinson and Kristine Ong Muslim. We’ll have ten pieces of original science fiction by exciting SF authors: Karin Lowachee (“A Good Home”), Steven Barnes (“Fifty Shades of Grays”), Isha Karki (“Firebird”), Lisa Allen-Agostini (“Depot 256”), Brian K. Hudson (“Digital Medicine”), Sofia Samatar (“The Red Thread”), Nick T. Chan (“Salto Mortal”), Dayo Ntwari (“Omoshango”), Terence Taylor (“Wilson’s Singularity”), and Gabriela Santiago (“As Long As It Takes to Make the World”). We also have a special flash fiction section curated by the talented Berit Ellingsen. We have flash from S.B. Divya (“Binaries”), Fabio Fernandes (“Other Metamorphoses”), Teresa Naval (“An Offertory to Our Drowned Gods”), Nin Harris (“Morning Cravings”), Jennifer Marie Brissett (“Breathe Deep, Breathe Free”), T.S. Bazelli (“The Peacemaker”), Caroline M. Yoachim (“Chocolate Milkshake Number 314”), Naru Dames Sundar (“A Handful Of Dal”), Kevin Jared Hosein (“Hiranyagarbha”), and JY Yang (“Four And Twenty Blackbirds”). Reprinted stories by Octavia Butler, Samuel R Delany, John Chu, Vandana Singh, and Edmee Pardo, selected by Nisi Shawl. Our nonfiction editor, Grace Dillon, has brought us some incredible essays and articles, and we have our usual assortment of author and artist spotlights. For our ebook readers—and for those who seek out the print edition of our special issue—we also include have our usual novella reprint and a novel excerpt. But as a special treat, Sunil Patel has collected the more than two dozen essays on life as a PoC reader and creator of science fiction that originally ran in our People of Colo(u)r Kickstarter campaign. All that, and of course we also have our usual assortment of author spotlights, along with an extra special book column. Big thank you to my fellow guest editors, the entire team at Lightspeed, and all the talented writers who sent in their stories to the special issue.